When I'm not writing, I'm painting or drawing. Fuel for my creativity: caffeine & serendipity. 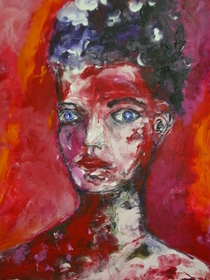 I write and paint to discover who's there. Watching a character develop on the page or canvas is a mystery and I like to be surprised. There's something about reading an old John Cheever story or a few pages of Fitzgerald that reminds me writing is all about possibility and exploring those possibilities one sentence at a time is still a magical pursuit. My reading list changes all the time. Right now, I'm reading Richard Russo short stories and falling in love. On my nightstand there's a book called,"Writers Dreaming," by Naomi Epel which explores the boundaries of imagination and dreams through a series of interviews with writers. It's a fascinating look at dreaming and creativity. I read as much poetry as I do fiction and non-fiction. Arlene, thank you so much for getting in touch, and for your comments! Arlene, it's good to have you with us in the Prick of the Spindle group. I peeked at your site, and love the linework in your art. What an interesting idea, Arlene. I'd never thought of doing a series of prose poems, but I suppose people must do it all the time! What a fascinating idea to have them all connected. I checked out your website. Your drawings are beautiful. What a talent you are in many ways. arlene. thanks for the comment on the same story. that pic on your website, thats chicago, right? the bridge that goes up to michigan ave? am i close? Hi, Arlene. Happy to see you here! I hope my prompt group becomes productive - groups are new to Fictionaut, and they aren't really going strong yet. It's nice to meet you - i checked out your website and read a few stories and really like your work. I'm thrilled to have met you here! You must log in to write on Arlene Tribbia's wall.